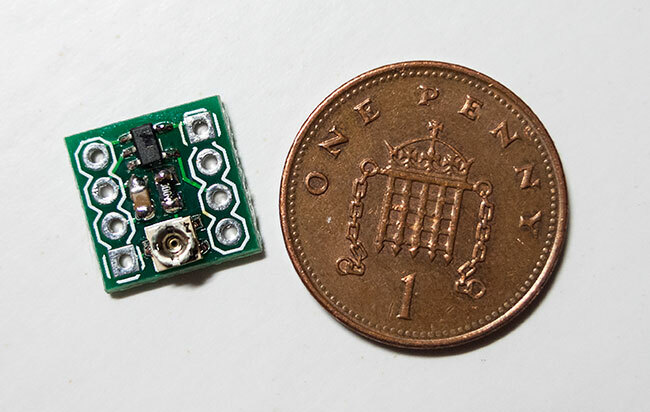 This module measures a tiny 11.5mm x 11.5mm, with a total height of just 3.5mm. 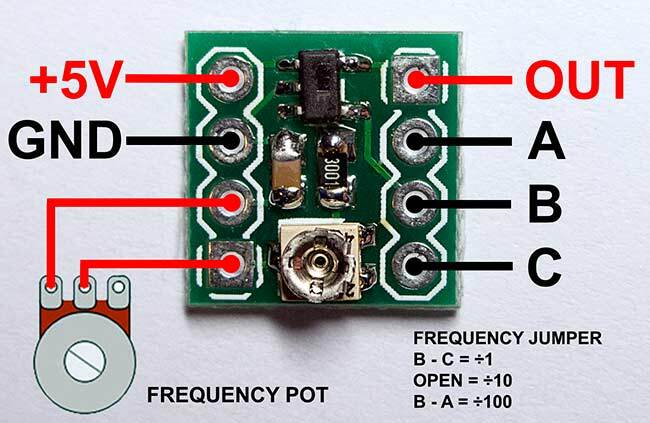 It comes as a complete LTC1799 oscillator module, so all you need to do is connect it to a 5v power supply and wire in a pot. The PCB is more or less the same size as an eight pin IC, and with the addition of the optional PCB pins it will fit into a standard DIP8 chip socket, stripboard or breadboard. On the right hand side there are three solder terminals labelled A, B and C in the image below. These allow you set the frequency divider to the required speed by soldering in a jumper wire. Check out the Linear Technology site for more details. For virtually all circuit bending jobs you'll be wanting to wire the middle jumper pad to the bottom one, or pad B to pad C in the wiring diagram below. You can use a small bit of cutoff component leg to do this. Make sure you remember this jumper, or your machine may run unusably slow! When choosing a frequency pot we'd recommend starting with 100K and then going bigger or smaller if it seems like you'd get better results. A linear pot is probably the best place to start, but you might find that a log pot gives you a better response curve. The only drawback of a log pot is that you might have to wire it backwards to get the best response, If this is the case its probably an idea to try an anti-log pot. These aren't commonly available, but you can find a good range at excellent prices from Toyda Electronics in Hong Kong. 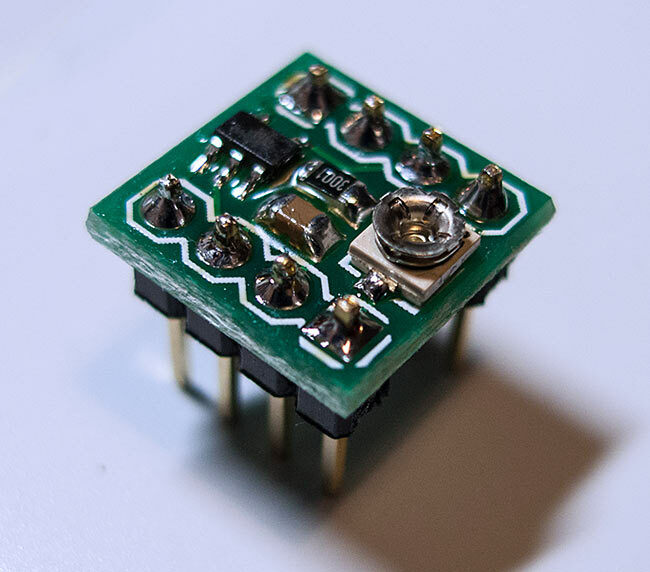 The module also features a tiny 22K trimmer pot that allows you to set the highest frequency the module can run at. This is very useful when installing the module as most machines will crash, or the audio will start to break up if you try to run them at too high a frequency. With a series of adjustments this trimmer will allow you to easily set the highest clock rate or pitch of a machine without having to mess around with swapping out different resistor values, or having to settle for a 'near enough' resistor as its all you have to hand. The trimmer rotates 360 degrees without an end stop, so care should be taken when adjusting it. Take a look at our general INSTALLATION GUIDE that covers the basics of installing a LTC1799 on many machines. We also have a specific tutorial detailing installing the older version of this module into a TR505 drum machine HERE. If you want to buy one or more of these modules click on the Buy Now button below. Payments are processed via Paypal, but you can pay using a credit or debit card without having a Paypal account. If you want to pay using some other method, please get in touch via the CONTACT page. For many installations the LTC module can be held in place with a piece of double sided sticky foam, or even double sided tape at a push. You might also be able to just use the wiring to keep it in place, if you use solid core wire. Sometimes you need a more robust mounting, or you might want to mount the module in a DIP8 socket or breadboard, so in this case we can include PCB mounting pins for 50p extra. The PCB pins will be supplied unsoldered, but we can pre solder them on request. Just leave a note on the order or CONTACT us with your order details. The modules cost £6 each with the mounting pins included. Take a look at our general installation guide for tips on how to install a LTC1799 module, or a tutorial on how to install this into a Roland TR505 drum machine HERE.